Rotork Australia have launched a new electric actuator for the operation of process control valves. The Rotork CVA range provides continuous, repeatable modulating control with a programmable fail to position option. Operating on an industry-standard 4-20mA control signal or digital bus, the resolution, repeatability and hysteresis performance of the CVA is quoted at <0.1% of full scale, making it suitable for the most demanding applications. Rotork Australia’s electric actuators can be used for the direct-drive actuation of linear or quarter-turn control valves. These actuators have accurate control valve automation, combined with advanced, non-intrusive calibration, valve diagnostics and user-friendly operational features. Mechanical features include Rotork Australia’s double-sealed enclosure, whereby internal electrical components are permanently protected from the effects of the operating atmosphere. The IP68 dust tight, watertight and temporarily submersible (7 metres, 72 hours) enclosure is universal to all models in the CVA range, including those with hazardous area approvals. The CVA is engineered to deliver high precision valve positioning and facilitate the tightest possible tolerances on the process variable, enabling process quality and output to be optimised. On loss of mains power, built-in super-capacitors allow the CVA to move the valve to a desired position, programmable as open, close, any intermediate position or stay-put. Manual operation is also optionally available. The CVA utilises a new variant of Rotork Australia’s innovative and well established non-intrusive communication technology for actuator programming and adjustment. Actuator set-up and configuration is performed using a Bluetooth enabled PDA or PC running Rotork Enlight software tool. Every CVA incorporates an onboard data logger, enabling operational data such as valve torque profiles, dwell times, actuator events and statistics to be downloaded for detailed investigation and diagnosis. After analysis, any required configuration changes can be uploaded into to the actuator. Digital control bus connectivity options for the CVA initially include Hart and Foundation Fieldbus protocols, facilitating enhanced installed economy as well as giving the CVA the increased ability to merge into existing asset management systems. The all-electric CVA design also simplifies the process of retrofitting actuators onto existing valves. Rotork Australia’s specialist Site Services organisation is available on a global basis to provide comprehensive support in these areas, from advice and surveys to installation and commissioning. When complete, the full range of CVA actuators will have a maximum rated thrust of 22.2kN (5000lbsf) with a maximum stroke of 114.3mm (4.5 inches), whilst quarter-turn actuators will supply a maximum rated torque of 677.5Nm (6000 inch lbs), enabling the range to operate most control valve types and sizes. Actuators can be specified for single-phase AC or DC electrical supplies. The launch of the CVA follows an exhaustive programme of market research, product development and field testing. 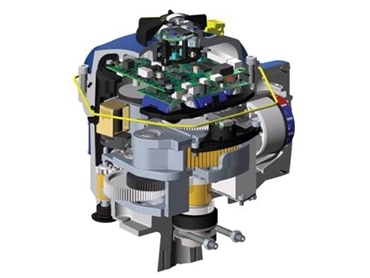 Rotork Australia’s research has identified significant enthusiasm for the introduction of viable electric actuation in the control valve market. The benefits in the reduction of on-going plant running and maintenance costs are apparent to both plant operators and owners.